« Why we should use videos to promote online? The idea of e-mail marketing is that in the first instance, you have a product or service that you want to sell or promote on the internet.In order to do so, you must have an effective way of putting your promotional materials or ideas in front of potential prospects, because you have to be able to tell people who might be interested in what you have to offer that you exist. More important than putting your promotional message in front of people who may become a prospect, however, is the concept that you should put your message in front of people who are already targeted. In other words, if you are promoting weight-loss products, then it makes sense to put your marketing message in front of people who you know are already interested in losing weight. If on the other hand you are selling something related to tropical fish, your message needs to be seen by the tropical fish community. By ensuring that your marketing message is seen by net users who are already prequalified because they are interested in your topic of subject matter, you ensure that your message has the maximum effect.Imagine however if your weight-loss information was put in front of tropical fish lovers, or vice versa. In this situation, it should be obvious that the favorable response you could expect would be absolutely minimal or non-existent. Thus, this is an extreme example of how not to market! There are plenty of different strategies that you can adopt to put your initial marketing message in front of your targeted audience. And because doing so will often be an extremely important aspect of any integrated e-mail marketing project that you decide to run, we will give some consideration to a few of these marketing methods a little later. However, the basic idea behind the e-mail marketing is that at some point and in some way, you obtain e-mail contact information from someone who is a pre-qualified or targeted prospect. At that point, you start to send that targeted prospect information about your product or services, in the hope that either sooner or later, that prospect will decide that the product or service that you are recommending is something that they have to have. Obviously, once they decide that they want or need to buy whatever it is you’re recommending, they become a customer of your business, an individual moneymaking centre to whom you can return time and again with further product recommendations and suggestions. 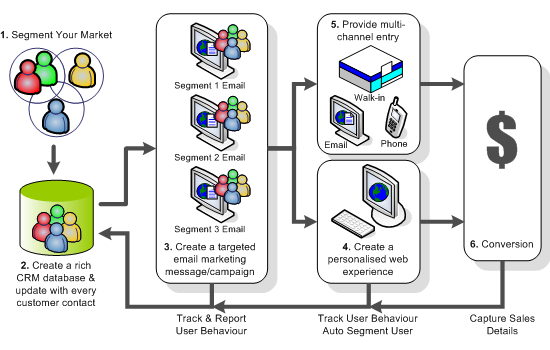 This in a nutshell is the central core of e-mail marketing and the concepts behind it.You have an individual’s e-mail information, you send details of products or services that you recommend and at some point, a certain percentage of the people to whom you are sending that information will decide to follow your suggestion and spend money with your business. If this summarization makes the concept of e-mail marketing sound extremely simple, that is a good thing, because e-mail marketing is essentially a very simple thing.On the other hand, if it was really just the simple, then it would be very difficult to understand why so many marketers seem to get e-mail marketing so tragically wrong. And the fact that they do so is the reason why you are reading this book in the first place. The truth is, there are many mistakes, pitfalls and errors that you can make whilst trying to build an e-mail marketing business. I will address these potential marketing landmines at the appropriate juncture as we go through this report, but to start, I want to look at a common mistake that almost every e-mail marketing beginner makes at some time or other. This entry was posted in Internet Marketing and tagged e-mail marketing, marketing message, marketing methods, Marketing Software, promote on the internet. Bookmark the permalink. Follow any comments here with the RSS feed for this post. Post a comment or leave a trackback: Trackback URL.